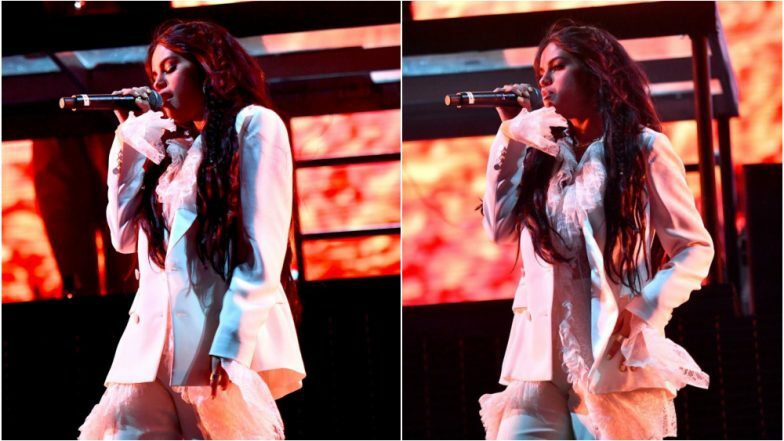 Selena Gomez Surprises Fans With Her First Ever Coachella Performance Along With Cardi B and DJ Snake - View Pics! Selena Gomez is back and how. The singer officially returned to the stage on Friday, as she made a surprise appearance during DJ Snake’s Coachella performance as they crooned to their hit song “Taki Taki” alongside Cardi B and Ozuna. This performance is special considering, this is Selena's first performance after her hospitalization and treatment in 2018. Watching the singer take to the stage, Gomez's fans were left screaming. Selena slayed like a queen even with her look as she rocked a gorgeous Lavender lace pantsuit. Cardi B, also went on to share a fun backstage moment on her Instagram story from Friday’s show as she posed alongside Gomez and DJ Snake and wrote, “Coachella and I love them." Ozuna also shared a picture with Selena and wrote a lovely message along with it. He wrote, "A beautiful woman with a lot of energy. I bet on you and I’m here for you. God bless you, my love!! "Justin Bieber Admits He Still Loves Selena Gomez But Is Head Over Heels for Wife Hailey Baldwin in His Instagram Post Addressed to a Troll. Selena was hospitalized twice in October, both times for a low white blood cell count, which can be a side effect for kidney transplant patients. Ever since fans have been hoping for recovery and were eager to see her back in action. Coachella 2019 Live Streaming on YouTube: Don’t Miss the Performances by Ariana Grande, Blackpink and Childish Gambino. Last month, Billboard had reported that Gomez has plans to release new music soon, and it looks like this Coachella performance was just the beginning of what we can expect from her in 2019.